You’re great at what you do and the numbers show it – business is going well and you can see plenty of opportunities to grow. The problem is, you’re already stretched too thin. You’re driven and committed and you’re not afraid to put in the work, but there are only so many hours in a day. You’ve done an amazing job steering the ship this far, and now it’s time to grow your team. But where should you start? And what type of support should you invest in? An online business manager (OBM) is a service provider who works on a freelance basis. They offer management-level support to busy online business owners. It might be on an ongoing basis to free the business owner up for other things, for a temporary period while the business owner takes a break, or for a limited time when things are particularly busy. 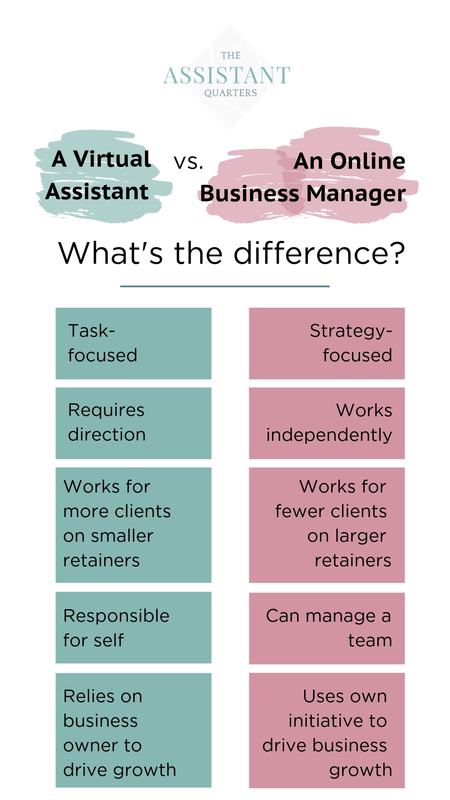 What’s the difference between an online business manager and a virtual assistant? An online business manager is often compared to a virtual assistant (VA), and some of the more experienced and ambitious VAs will go on to offer OBM services. An online business manager is much more than just a great VA, however. They offer a different set of services and their skills and priorities differ, too. What is an online business manager responsible for? How can I benefit from hiring an online business manager? Taking on an OBM could drastically change your future, both in your business and outside of it. If you’ve got big ideas and plenty of opportunities, this could be your chance to make them happen. A smart OBM will support their clients with strategy, and they’re often a good sounding board for business owners who need help organising their thoughts and connecting the dots. If you grow, your OBM will grow, so they’re committed to making your business a success. They’ll be invested, but never as emotionally wrapped up in the business as you are, so they can maintain a level of distance that gives them clarity and objectivity. A lesser-known benefit that some (but not all) online business managers will bring is their little black book of contacts. Some even have their own teams, which means working relationships, communication channels, and processes are already established. At The Assistant Quarters, for example, our founder Claire (who offers online business management services) has built a growing team of virtual assistants and social media specialists. As your business grows and new opportunities pop up, Claire could call on her team and her wider network of contacts to find the support you need. 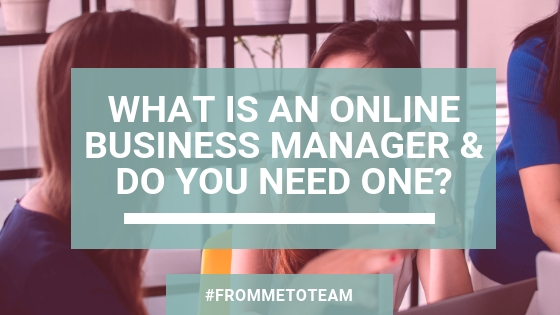 Some online business managers (Claire included), can also act as an informal coach, bringing their own experiences and the lessons they’ve learned from working with other clients to the table. When an online business manager is overseeing the day-to-day, you’ll be free to work on things like vision, strategy, brand development, and new partnerships. And, because it’s what comes naturally to them, a good OBM will do more than just keep things ticking over. They’ll tighten up systems and processes, improve communications, and take action when it’s needed. In the long run, you’ll benefit not only from having more free time to focus on growth, but also from the knowledge, skills, and contacts that a strong online business manager will bring. When should I consider hiring an online business manager? If you’re feeling ready to push forward with the next big thing, but your time is already limited, it might be the right time to think about working with an OBM. An OBM will give you the most freedom when you’ve already established workflows, processes, and channels of communication. They can help improve and refine systems like this, but if you want them to work independently so you can focus on other things, it’ll help if your business is already running well. In cases where you’re looking to establish new systems and ways of operating, an OBM can work with you to plan and develop, sharing the workload and supporting you with strategy, decision-making, and comms. Where you’re in a season of rest in your business (either because you’re happy with where you’re at or because you have other commitments that are taking up your time), a trusted OBM could give you the freedom you need to step away from it all for while. Again, in this instance, it’ll work best when your business is already established and running smoothly. What should I look for in an online business manager? An online business manager should have a background in leadership and project management. You need someone who’s a self-starter, able to use their initiative, work independently, make decisions, and follow through to make things happen. Beyond that, you’re looking for a good all-around communicator. Someone who writes, talks, and listens well, and is at ease talking to a wide variety of people. You should also consider your own skills (or, more importantly – your skill gaps). An OBM who’s a good fit for you will have complementary traits and skills. When it comes to the tools and systems they can use, you should expect to see a long list of capabilities. Think about everything you use to run your business and make sure the OBM can manage all of that and more. Finally, personality is a big one. If this is someone you’re going to trust to help you run your business and make management decisions, you’ll need to have a strong, healthy working relationship. How much do online business managers charge? Rates and packages vary from OBM to OBM, and the type and level of support you’re looking for will affect how much you pay. As yet, there’s no definitive guide or industry comparisons around how much OBMs charge. Our own research tells us that hourly rates start from around £40 and can increase up to £120 or more depending on experience and skills. Retainer packages typically start from around £600 per month up to (and beyond) £3000 as responsibilities increase. Our own online business management package starts at £1000 per month. The service will be totally unique to you, but you can find out more about what that package could include here. An online business manager provides a much higher level of service than a VA.
They’ll oversee the smooth running of your business, giving you the freedom to pursue growth, focus on other things, or take some time out. Rates vary, but you can expect to pay at least £40 an hour up to £120 or more. Retainer packages typically start from around £600 per month up to £3000 or more. Want to chat about your options? Taking on an OBM is a big move, and we understand that you’ll have lots of questions. As much as we’ve done our best here to create a short guide that provides answers, nothing beats a one on one chat where you can get specific about your own business. Call Claire on 0208 064 1969, or book in for a discovery call to start a conversation.